As modern technology evolves, consumers expect the newest phones, TVs, cars and more to constantly come out with new features that make life that much more convenient. And this evolution doesn’t just apply to electronics! When it comes to toilets, many people think there is only one type – the good old fashioned porcelain toilet that we’re all familiar with. But that actually couldn’t be farther from the truth! There are many types of toilets that are modern and high-functioning, which include advanced features. From high efficiency toilets to water-saving technology to the modern super flush toilet, answering the question of how to choose a toilet requires more though than it used to. 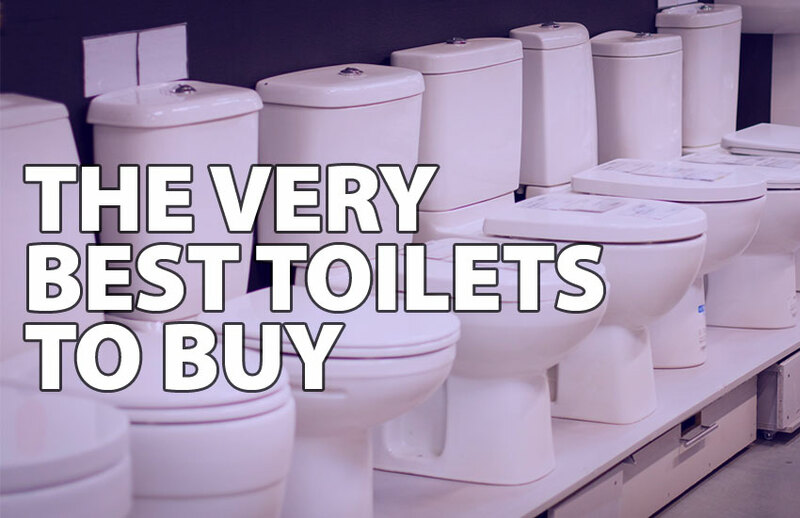 Whether you’re remodeling your bathroom or just looking to replace the current toilet in your home (or maybe you’re just looking for a more comfortable toilet seat) this in depth buying guide can help you find the best toilets to buy that match your needs and your budget. So what is the best toilet to buy? Let’s take a closer look. When you’re thinking about purchasing a toilet, you’ll want to ask yourself whether a pressure assisted toilet or a gravity feed toilet is best for your needs. The best toilet to buy usually falls into one of these two categories, though statistically, more people tend to go with the gravity feed model. So what’s the difference between these two toilets? A pressure assist toilet, also known as a pressure-flush toilet, uses compressed air, or a small water pump to generate its flushing power. Now let’s take a look at the other model to consider when answering the question of how to choose a toilet – the gravity feed toilet. A gravity feed toilet is what is sounds like; it uses gravity to operate. To move water down the drain, water simply drops from the toilet’s tank down into the bowl, which doesn’t use as much water pressure. As with any type of purchase, the pros are good for sure and not so good for others, while the cons may or may not be a factor for your particular needs. It’s wise to take a look at these pros and cons and then decide what is important to you when you ask yourself what is the best toilet to buy. When you’re looking for the best toilets to buy, you also want to be conscious of more than just pressure assist versus gravity feed; it’s a good idea to take an in depth look at the specific features that toilet model offers. Flush mechanism – keep in mind that nowadays, plastic flush towers are common, as they last longer over time (rubber flaps aren’t commonly used anymore). Water supply lines – if your water supply lines are made of chrome-plated copper, you may want to consider replacing them with stainless steel. Furthermore, investing in a water shut-off valve is a good idea. WaterSense certification – it’s also a good idea to invest in WaterSense certification, which means that specific toilet model uses 1.28 gallons or less per flush (compared to 1.6 gallons). This means the toilet is highly efficient and more water environmentally conscious. Dual-flush technology – when toilets incorporate dual-flush technology, this means you push a button like the one shown in the image below. One button is designed for liquid waste and one button is designed for solid waste (a more full flush). Touchless flushing – if you’re especially germ conscious, touchless flushing is a great feature to consider. Toilets with this built in use a sensor and allow you to simply wave your hand to begin a flush. Sometimes it comes built into toilets, while sometimes you can buy a separate kit to install on an existing toilet (though this only works with certain models). Bowl shape – consider whether you want a round vs elongated toilet bowl shape (elongated bowls take up more space than round bowls). The benefit of an elongated bowl shape is that some people find that it’s more comfortable to sit on. Think about what standard toilet size works best for your bathroom. Flush valve – to ensure that water is transferred from the tank into the bowl, gravity flow toilets utilize a flush valve. The thicker the valve, the more pressure it puts out when transferring the water. Two-piece design – most of the toilets on the market utilize a two-piece design, which is less expensive than a one-piece design; this means the tank is separate from the actual toilet bowl. Keep in mind that two-piece design toilets are harder to clean, as the seam between the pieces can collect dirt and grime over time. Rough-in dimensions – be sure to take measurements before you shop for a toilet. The rough-in dimensions signify the distance between the back wall to connect to the water line. Noise level – depending on where your bathroom is located, the noise the flush makes is important to consider. If your bathroom is near your kitchen or a gathering area, you may want to invest in a quieter gravity feed toilet to minimize noise. Color – though the most commonly purchased toilet color is white, there are other colors available. Bowl height – a comfort height toilet is 17 to 19 inches high, which is the approved handicap toilet height (when compared to lower-to-the-ground toilets, which are normally 14 to 15 inches high). Concealed or skirted trapways – the visible bends on the backside of the toilet are called trapways. If the trapways are concealed, they have a smooth surface, whereas skirted trapways show a clean line from the front to the back of the toilet. Hopefully this guide will help you approach the question of how to buy a toilet when you need assistance!